We manufacture Polymer Emulsion that are highly effective bonding agents. Single Pack Polymer Emulsion POLY-HACK is a specially developed single pack polymer emulsion interface for strengthening bond between plaster and concrete (new as well as old). It can also be used for installation of ceramic or glazed tiles on concrete. As a special application it can also be used to coat reinforcement steel. The surface starts becoming tacky in 10 to 20 minutes. Coverage: Approximately 100 ft2 / litre of POLY-HACK on a relatively smooth surface. Packing: Available in 1, 2, 5, 20, 35, 50 & 220 kg packs. Shelf life: The shelf life is 1 year when stored in original pack in cool and dry place. 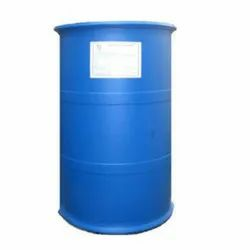 Acrylic Emulsion Polymer Waterproofing Coating CEMACRYL is high performance waterproofing coating based on modified acrylic emulsion polymer. This is dual purpose product which can be used directly as waterproofing coating OR also to modify cementitious mortars and plasters to make them waterproof. When added to plasters and cementitious mortars, CEMACRYL improves their waterproofing ability, their ability to bond to concrete, masonry and wood, improves their flexural strength, impact resistance and abrasion resistance. 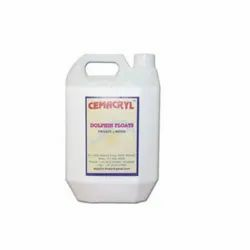 When applied as waterproofing coating, CEMACRYL gives excellent results for roof top slabs, water tanks, swimming pools, sunken slabs & any other wet slabs / retaining walls etc. Use as water barrier under brickbat coba and on sunken slabs (toilets / wet areas) as undercoat below mortars. Use also as water barrier paint on vertical external walls. Preparation: Thoroughly clean the surface of all grease, oil, dust, mould release agents, laitance etc. Repair spalled and cracked concrete / plaster. Wet the surface. Mixing: Mix Water : CEMACRYL (1 : 1 by weight). Keep the mixture slowly stirred. Add Pozzolana Portland Cement (3 parts by weight) gradually to form homogeneous slurry. Stir continuously for thorough mixing. Consume the mix within 1 hour. STRONGPLAST 3 mm PP fibres (3 gm / 1 kg) can be added for further improvement of performance. Painting: Apply 2 coats at right angles to each other with a gap of 12-14 hours. Each coat to be approx. 0.3 mm thick. Coverage (double coat) is approx. 40 sq.ft. per 1 L CEMACRYL. Curing: Allow curing with wet gunny bags for 24 hours after second coat. Allow 3 days of natural drying prior to water tests or further working. Looking for Polymer Emulsion ?